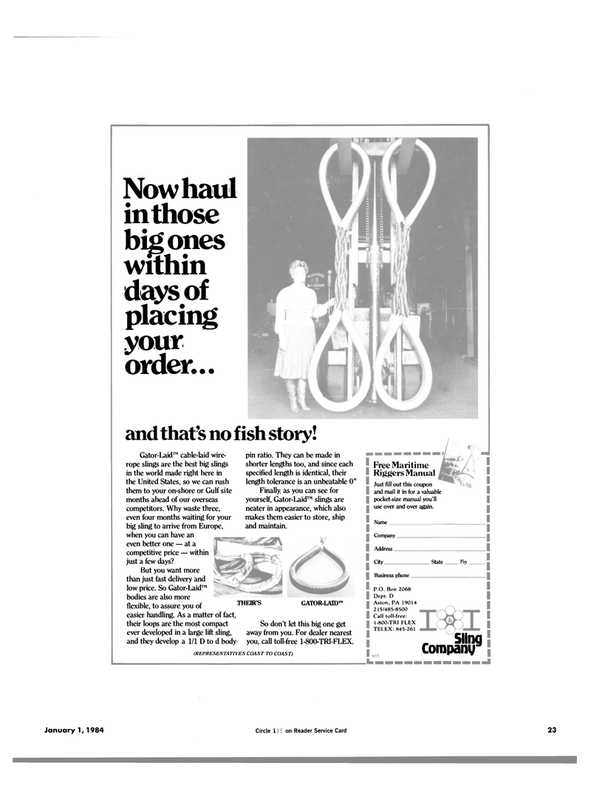 Now haul in those big ones within days of placing your order... and that's no fish story! Gator-Laid™ cable-laid wire- rope slings are the best big slings in the world made right here in the United States, so we can rush them to your on-shore or Gulf site months ahead of our overseas competitors. Why waste three, even four months waiting for your big sling to arrive from Europe, when you can have an even better one — at a competitive price — within just a few days? But you want more than just fast delivery and low price. So Gator-Laid™ bodies are also more flexible, to assure you of easier handling. As a matter of fact, their loops are the most compact ever developed in a large lift sling, and they develop a 1/1 D to d body pin ratio. They can be made in shorter lengths too, and since each specified length is identical, their length tolerance is an unbeatable 0"
Finally, as you can see for yourself, Gator-Laid™ slings are neater in appearance, which also makes them easier to store, ship and maintain. So don't let this big one get away from you. For dealer nearest you, call toll-free 1-800-TRI-FLEX. Just fill out this coupon and mail it in for a valuable pocket-size manual you'll use over and over again. City . State _ Zip.